But where or what is Gangnam? Well, the Economist reported recently from Gangnam itself in Seoul, South Korea, where just to get into the best private tuition after-school study groups, children have to pass exams; the children are cramming for crammers. These are the Hagwon schools and the best are called Sekki (cub) – most of them in fashionable Daechi-dong in stylish Gangnam (yes that one). Students work at a level up to 5 years ahead of their age group syllabus and often arrive home tired and late after a double day in education. A law is now being proposed to ban children from studying in private tuition after 10 pm. Children also spend their free periods at school doing extra homework for Hagwon. Parents spend 0.8 % of GDP (or a tenth of all household income) on private education, which puts South Korea top on the Private Tuition World League (Britain is 8th with 0.4% of GDP). But few parents actually admit to enrolling. But this is what we in the West are up against – huge achievement in South East Asia. Demand for tuition is so high (sigh!) in Seoul, South Korea that no advertising is needed. But does this have a measurable impact upon results? Well, yes. according to the latest PISA study (not the leaning tower, rather the international education benchmark for 15 year olds in 72 countries). Korea is in the top ten for Maths and reading and 11th for Science (Singapore as ever dominates). While the U.K. has climbed to 15th in Science it has dropped to 27th in Maths. A sobering thought. Should the U.K. strive to match SE Asia by copying their “learning by wrote” mastery techniques, or push on with our strategy of “real world” syllabus questions perhaps more relevant to the workplace. That’s for a future blog! Gangnam is a fashionable district of Seoul in South Korea described as affluent and the equivalent of Beverley Hills or Chelsea. 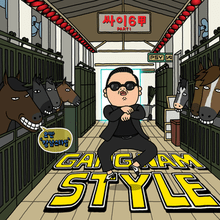 Psy wrote “Gangnam Style” as a slightly ironic social comment on Gangnam residents lifestyle. This entry was posted in Celebrity, Maths and tagged Numbers on January 27, 2016 by Rick 1. One Direction were in the news yesterday for postponing a concert, but the Mathemateer is more interested in the group’s Maths song. Yes there is one, and it’s good ! As described below – can you do the mental Maths? ! Hear it here. It features a series of quick, simple, mental maths tasks whose eventual answer is 130. At GCSE level this would not constitute a genuine question but on the other hand the lost art of mental maths should not be underestimated. As a warm up exercise before a test you could do worse than follow this through. Well done 1D as I think I should call them! This entry was posted in Celebrity, Maths and tagged Mental Maths on October 22, 2015 by Rick 1.